One person was killed and six others injured when an under-construction bridge on the Pathankot-Mandi national highway collapsed near Palampur this evening. A devastating fire that broke out in Chichwadi village in Rohal panchayat of Rohru around midnight has left over 80 families homeless. Considering the strict restrictions on land purchase in Himachal Pradesh, the benevolence being showered by the government in allowing use of industrial plots for commercial use in the Shoghi industrial estate could see 5-star hotels, multiplexes, conference halls and training institutes come up side by side with the few existing industries. Despite pressure exerted by the Minister for Industries, Kishan Kapoor, the cement companies have not given any assurance to the government of reducing cement bag prices in the state. Hamirpur residents are forced to buy a bag of cement at Rs 327 in retail where as in most parts of the state cement is selling between Rs 290 to Rs 295 per bag. The two major manufacturing companies --- Ambuja Cement Company Darlaghat and Associated Cement Companies (ACC) unit Barmana --- which are the main sellers of the cement in this region, have kept the retail price of the cement bag in Hamirpur at Rs 327 per bag. Under Opposition attack, Chief Minister Prem Kumar Dhumal has defended the opening of private universities in the state. The Commissioned Contract Lecturers' Association (CCLA) ha decided to launch a common front with state’s over 15,000 contract employees against the government, challenging its contract policy and the different recruitment and promotion (R and P) rules for the same posts in the same department. The HP High Court has directed the Director-General of Police to furnish details of the police officers whose names figure on the current ODI (officers with doubtful integrity) list with their places of posting. Children of the staff of Dr Rajendra Prasad Government Medical College and Hospital (Dr RPGMC), Tanda, in the age group of 3 to 4 years, studying in the playway school being run by the Dr RPGMC Educational Society came out of their playing arena to celebrate Christmas with their counterparts admitted in the children’s ward of the hospital. Forest Department officials saved a leopard at Banghali village in the Palampur forest range on late Thursday evening. The Congress today accused the BJP of politicising the issue of appointment of PTA teachers as they had been appointed during their rule. The All-India National Integration Camp being held here at the local Bishop Cotton School (BCS) yesterday concluded with NCC cadets from across the country taking part in it. A corpse was found in a forest near Indora in this sub-division on Friday. According to information, some local women went in the forest to collect firewood when they spotted the corpse. The burglars broke into a house of Sujata Devi, a resident of Fatoh, Baldwara in Sarkahat and decamped with jewellery worth Rs 2.50 lakh on Friday. The accident took place at 4.45 PM when a span of 400-metre bypass bridge on the national highway fell down killing one person on the spot. As many as 15 persons were working on the site at the time of the accident. All the six injured were immediately taken to the local Civil Hospital where the condition of two was stated to be serious. It may be recalled that this was the second accident at the same site. 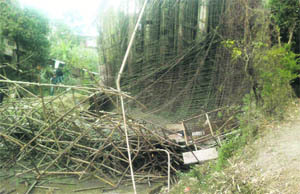 In December 2010, a portion of the bridge had collapsed killing an inspector of PWD. After a gap of a year, the NHAI authorities resumed the construction of the bridge and persuaded the contractor to go head with the work. But today again, the same portion of the bridge collapsed. Chief Minister Prem Kumar Dhumal, who was in the town, has ordered a high-level probe and deputed a high-level team of PWD officials from Shimla to conduct inquiry. He directed Ajay Mittal, Secretary, PWD, to visit the spot immediately. He said the government would not spare anybody responsible for the accident and use of poor quality material, which led to the accident twice on the same site killing two persons. Meanwhile, Ravinder Thakur, Irrigation and Public Health Minister, reached the spot and supervised the relief and rescue operation. He also visited the Civil Hospital and met the injured. The fire, the cause of which is still not known, reduced more than 65 wooden houses to ashes while 15 houses were partially burnt. Though there has been no loss of human life, over 200 cattle perished in the fire. The village is located at a distance of 35 km from Rohru, sub-divisional headquarters. 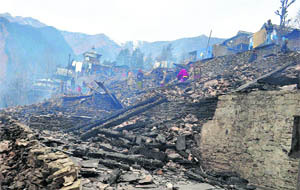 MR Dhiman, Sub-Divisional Magistrate (SDM), Rohru, said fire tenders were not of much help due to village’s poor connectivity. He said a relief of Rs 2 lakh had been disbursed among the affected families. The victims have also been provided with ration for 15 days, utensils, blankets and other essential items. Efforts were on to help provide them with immediate shelter in view of the harsh weather. Meanwhile, villagers of the adjoining areas have provided shelter to the people for the time being. Governor Urmila Singh and Chief Minister PK Dhumal have expressed grief over the incident. They directed the administration to provide immediate relief and help to the affected families at the earliest. The sleepy industrial estate of Shoghi, near here could soon be buzzing with activities as in a rare and unanticipated move, the state government has decided to allow use of the industrial plots for commercial purposes by declaring it as a service sector area under micro, small and medium industry. As such for those owning a plot or shed here, it could turn out to be a lifetime opportunity to set up a multiplex, hotel or a training institute, land for which would have otherwise cost exorbitant amount. Moreover, no permission under Section 118 of the Tenancy and Land Reform Act would be required for these commercial ventures or separate permission for change of land use. The Industries Department has already received 34 proposals, including seven for setting up of hotels. So far, permission for change from industrial to commercial use has been granted in five cases. Some of the proposals include a 5-star hotel to be constructed at a cost of over Rs 100 crore, showrooms of automobiles and a manpower research institute. The exception of allowing industrial land for commercial use has so far been made only in case of Shoghi. No doubt the Shoghi industrial area set up in 1988 has failed to take the shape of a booming industrial estate, but the move is being widely criticised as it allows plot holders easy switchover to commercial activity. “If an exception can be made in case of Shoghi why not for other industrial estates and we too will demand that we should also be given the liberty to start commercial activity,” said an entrepreneur owning a sick unit in Kala Amb in Sirmour. The Shoghi industrial area has 110 plots and five sheds with area ranging from 250 sq mts to 5,000 sq mts. “The total area of the industrial estate is almost one lakh sq mts and at present barely 25 units are into operation that too not on a regular basis,” said an industries official. The sources available here told The Tribune that meeting between the Minister for Industries and cement industry representatives remained inconclusive. The minister has, now, threatened to withdraw various facilities and financial incentives being extended to cement companies in case they fail to abide by the government diktat for reducing the cement prices in the state. When contacted, the minister said the state government was providing cheaper electricity, about Rs 50-crore transport subsidy and other incentives worth Rs 350 crore to the cement companies in the state. In case the companies do not reduce the cement bag prices, the state government can increase power tariff and withdraw the transport facility extended to them, he added. Later in the afternoon, the Minister for Industries in a press conference said that he has asked the cement companies to reduce cement bag prices by Rs 30 across the state. He alleged that as per the report of the tariff commission, a 50-kg cement bag costs Rs 178 to the cement companies. The companies were making exorbitant profit by selling cement bags at prices ranging from Rs 305 to Rs 350 in the state, he alleged. The minister also alleged that the cement companies were selling cement bags at a price of Rs 214 per bag to Thai Corporation carrying out the construction work of Kol Dam in Bilaspur district of the state. However, the cement bags are being sold at prices up to Rs 345 to residents of the state. There is no logic in the selling cement at such high price to the state residents, he alleged. The issue of high cement prices also rocked the Himachal Vidhan Sabha during the five-day winter session that concluded yesterday at Dharamsala. The Opposition members asked about the steps being taken by the government to reduce the cement prices in the state. The government maintained that the Central Government deregulated the prices of cement in 2002. Since cement does not come under the Essential Commodities Act, the government is not empowered to direct the cement companies to reduce their prices. The CM also assured the house that he would write to the Prime Minister for re-inclusion of cement under the Essential Commodities Act. The cement companies had earlier offered to reduce cement bag prices in the state by Rs 10. However, the offer was not accepted by the Industries Minister, who yesterday gave the diktat to the companies to reduce per bag price by Rs 30. The wholesale rate of cement in Hamirpur is Rs 323, but in areas bordering Bilaspur district a cement bag is selling for Rs 298. Speaking during a state-level workshop on National Vocational Educational Qualifications Frame Work in Himachal Pradesh organised at Palampur Agriculture University, the CM said people with vested interests were opposing the idea of private universities in the state. Dhumal said Himachal has just 11 private universities and the state has the distinction of appointing first regulatory commission over these universities to monitor their working. Speaking at the workshop, SS Mantha, chairman of All-India Council of Technical Education (AICTE), said the number of unemployed in the country was about 46 million. It is likely to grow to about 50 million very soon. Vocational education along with the school of college education is the only method of increasing the employability of youth the country, he said. Ashok Thakur, Special Secretary union ministry for HRD while speaking on the occasion said that just 4 percent students in India get vocational training whereas in China 40 percent and Germany 54 percent get vocational training. The BJP was against reservation on the basis of religion and it would oppose the reservation for Muslims in government jobs proposed by the Union Cabinet, said Chief Minister Prem Kumar Dhumal today. He was reacting to query regarding 4 per cent reservation proposed for Muslims by the Union Cabinet. Dhumal said the reservation for Muslims was unconstitutional. The Indian constitution does not provide any provision for giving reservation on the basis of religion. Talking to The Tribune here, Manoj Kumar, former president, CCLA, said they would hold a meeting tomorrow at Bilaspur as the government had been setting up different contract policies and R and P rules for school lecturers for the same posts, which was not justified. He said the government had different R and P rules for contract lecturers appointed in schools in 2004 and different for those appointed in 2010 by the government through the HP Subordinate Services selection Board. This was unfair and unjustified as they have been appointed through the board, school lecturers resented. He said there were over 2,000 school lecturers appointed through the board. “All the employees appointed on contract basis are in touch with us to oppose the government policy of setting up different R and P rules for the same posts and the policy was discriminatory,” he added. He said the Punjab Government had regularised all contract school lecturers and the state government should also follow the same here as well. A Division Bench comprising Chief Justice Kurian Joseph and Justice Dev Darshan Sud also directed the DGP to furnish the details by filing an affidavit explaining the reasons for retaining such officers at sensitive postings, if any of them were posted as such. The court passed the orders on an appeal by three police officers from Sirmour challenging their transfer from the district constabulary to police battalions. They had contended in their appeal that there were numerous police officers, whose names figured on the current ODI list, who were continuing at sensitive posts. The court listed the matter for January 5, 2012. The toddlers, dressed as Santa Claus, moved in a group on the hospital premises enjoying and distributing fruits and sweets to patients and their attendants. They distributed fruits, sweets, toys and chocolates among the children in the wards and on the campus of the hospital. Sharma, Sandeep Dogra, parents of the children, and staff of the school. Meanwhile, Santa Claus also distributed sweets among the students of Dronacharya College of Education, Rait. Students of the college donated 50 units of blood today to mark the occasion. The Conservator, Forest Dharamsala, ARM Reddy told The Tribune that the leopard was trapped in a snare wire laid allegedly by poachers in the area. The front paw of the leopard got trapped in the snare. As the leopard struggled to get out of trap and roared, villagers gathered around it. Forest officials reached the spot at 11.30 pm after getting the information. Timely arrival of forest officials saved the life of leopard as villagers in panic had set a fire around the leopard. The officials with the help of the police doused the fire. A team was summoned from Gopalpur zoo. The animal was sedated with tranquiliser procured from Veterinary College of Palampur Agriculture University and later it was rescued. The Conservator said the injuries to the animal were not serious. The rescued leopard had been sent to the Gopalpur zoo. The Conservator said a decision regarding releasing of the injured leopard back into the forest would be taken by the chief wildlife warden. The Forest Department has also got a case registered in the local police station. The Conservator said this was the second incident within a week when the life of a leopard was threatened in Kangra district. Meanwhile, in another incident on Wednesday, a leopard strayed into the house of a villager in the Nurpur area. Later, the animal was beaten to death by the locals. The Forest Department has got the case registered in the matter. 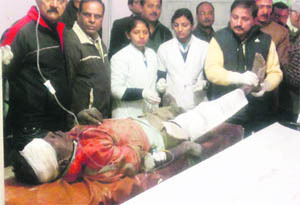 The three people injured by the leopard in Nurpur would be given compensation by the Forest Department. In a statement issued here today, Himachal Pradesh Congress Committee chief Kaul Singh Thakur said Chief Minister PK Dhumal was trying to mislead PTA teachers on the issue. “Since the appointments of PTA teachers were made during the Congress regime, the BJP had taken a policy decision to remove them from the service,” he said. The Congress chief said it was owing to the opposition from the Congress and the intervention of the court on PTA appointments that the BJP could not do away with the PTA teachers. He said the court had in no uncertain terms made it clear that the PTA teachers should not be removed till regular appointment was not made. Thakur assured that the Congress while coming back to power would give justice to the PTA teachers by looking for a permanent solution to their grievances. He cautioned them not to get misled by false assurances being given by the BJP regime. The police registered a case on the complaint of Sujata. The miscreants could not be identified yet. She said the family had gone out when the miscreants broke into the house. The efforts are afoot to nab the culprits and recover the stolen property, the police said.